- After you’ve made a purchase Charlie will offer you a job. He wants some local stiffs rendered even stiffer, and he needs an outsider to do the job. If you want some extra experience you can weasel the name of Charlie’s boss out of him, and if you’re really persuasive you can get him to pay extra for your services. The first is down the thin street that connects the front of Goodneighbor with the rest of the settlement, along the side of the Old State House. There are three floors in this warehouse and a grand total of eight Triggermen. Given the tight hallways and excess of cover it’s incredibly easy to move through here undetected and kill everybody, though things get a bit hairier on the third floor as the space opens a bit. Still, not too bad. The guys have plenty on ‘em to pilfer, and the warehouse itself is nicely-stocked, though bear in mind that everything you take that wasn’t on a body will be considered stolen property. The second is riiiiiight beside the first. You stand a good chance of getting discovered the moment you enter, as there are two Triggermen in the first room on your right. That aside, it’s a fairly easy trip through eight goons spread among four floors. This place is more open, so it’s pretty easy to shoot dudes down from the stairwells. The third is right beside The Memory Den. This place is a bit trickier since the layout’s a little wonky. The first floor is fine, but the second actually has two paths to the third, and it’s entirely possible to neglect the two dudes up the impromptu ramp on your right as you come up the stairs. They can flank you harshly if you make lots of noise. Eight more to kill here, evenly spread throughout the building. 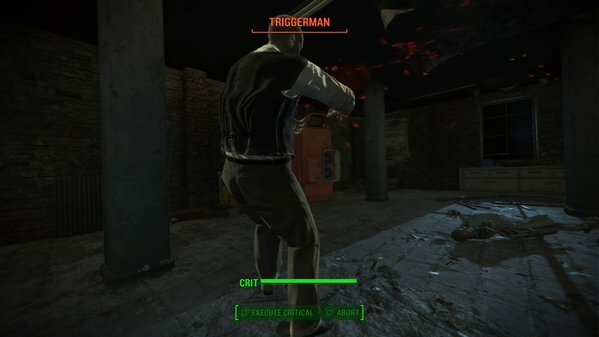 - Once you kill your last Triggerman you’ll be told the quest is done. Return to Charlie for your reward.